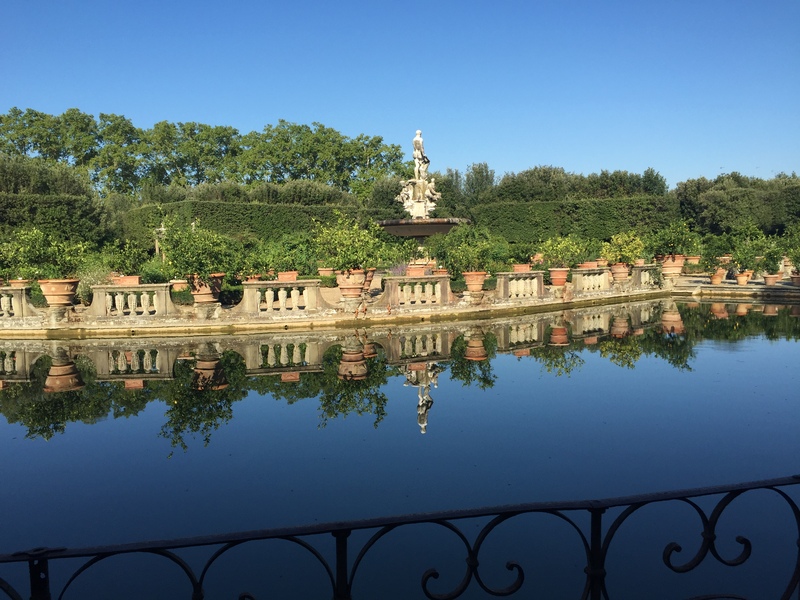 Much like last month’s reminiscence of my visit to Vaux-le-Vicomte, this month I thought I would bring you more travel pictures turned garden inspiration…this time via a journey to Italy. Hopefully it will help us all make it through this last full month of winter weather, until we can get outdoors and into our gardens and outdoor living spaces this spring. 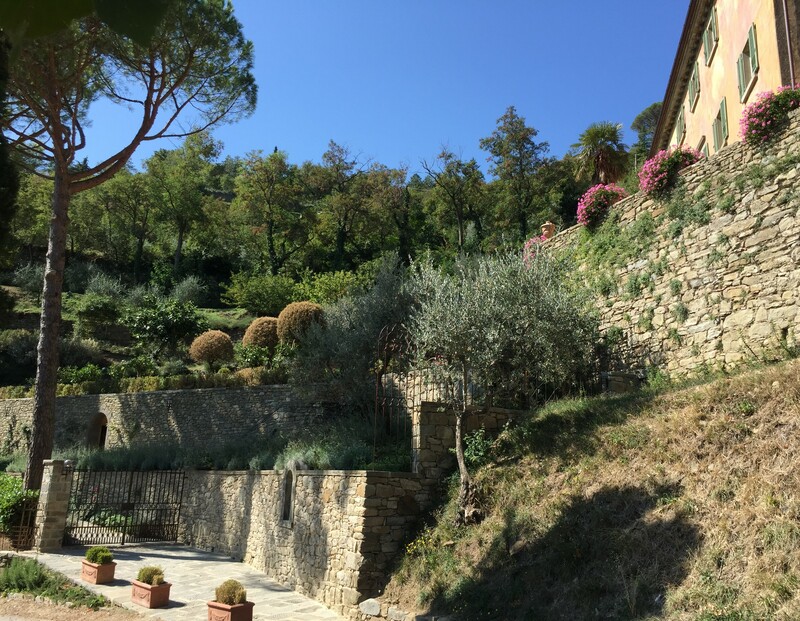 And, hey, what better way to start the week of Valentine’s Day than with a romantic garden tour of Florence and the surrounding hillside towns of Tuscany? Accompanied by a group of friends, some new and some old, I began my trip in Florence, or Firenze. The capital of Tuscany, Florence is also the birthplace of the Renaissance, the hometown of Gucci and the famed Medici family and the final resting place of Michelangelo. 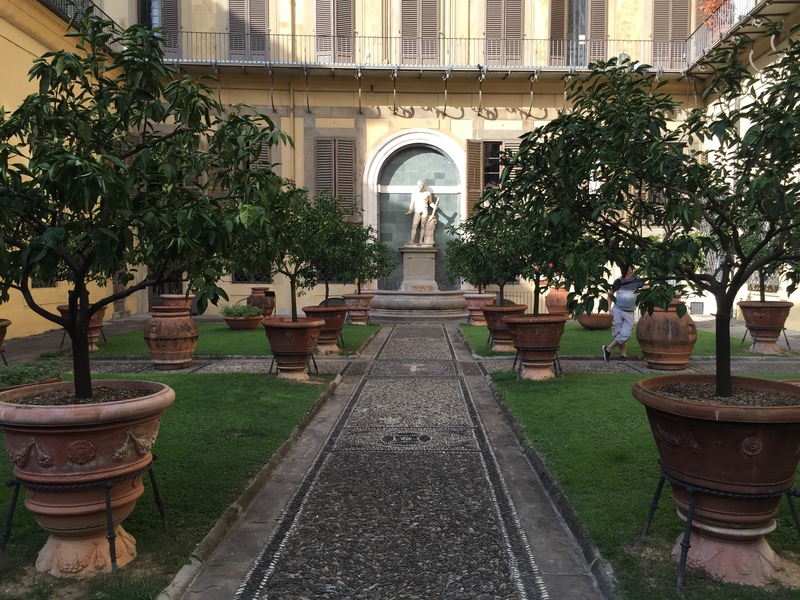 From personal experience, I can tell you Florence is also home to some damn good pizza, and luckily for us, gardens! 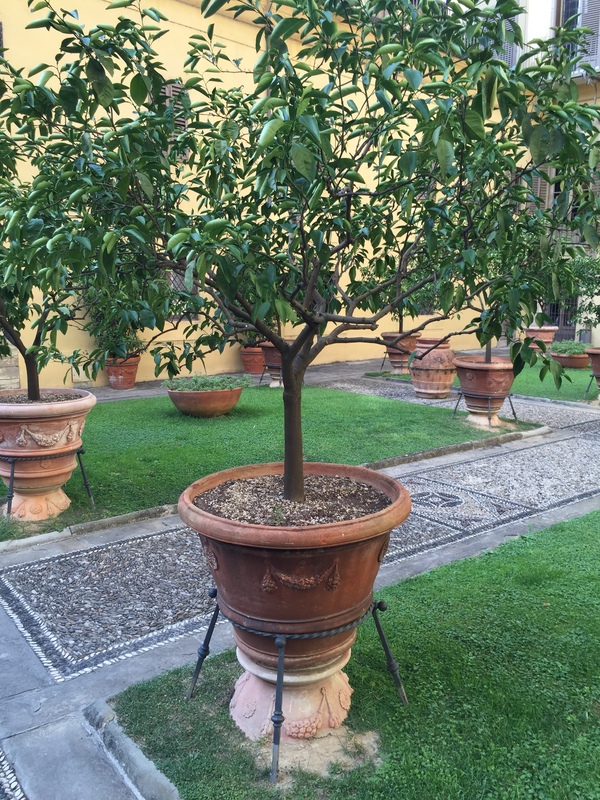 My first stop was this beautiful courtyard at the Palazzo Medici Riccardi, meticulously arranged with citrus-filled terracotta planters. 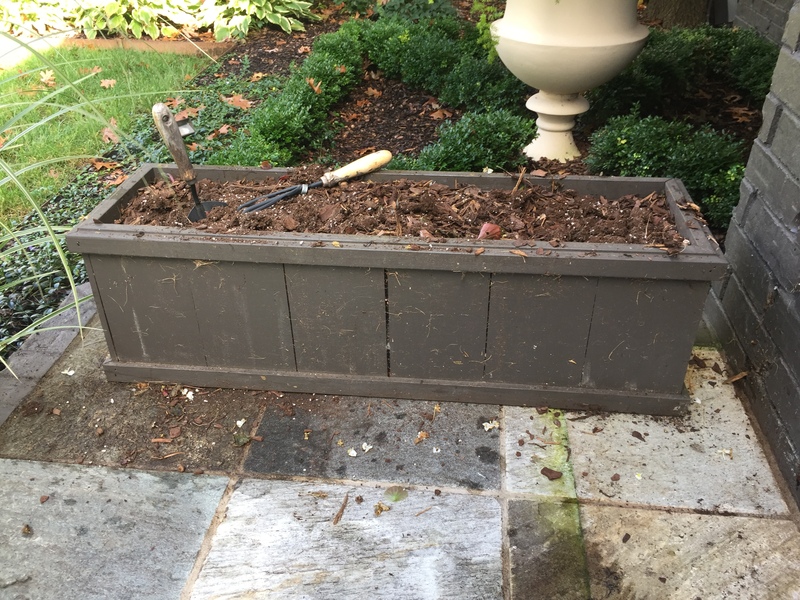 I thought it was particularly interesting (and attractive) how the planters sit on what appear to be the overturned bases of other planters and stabilized with custom iron work. 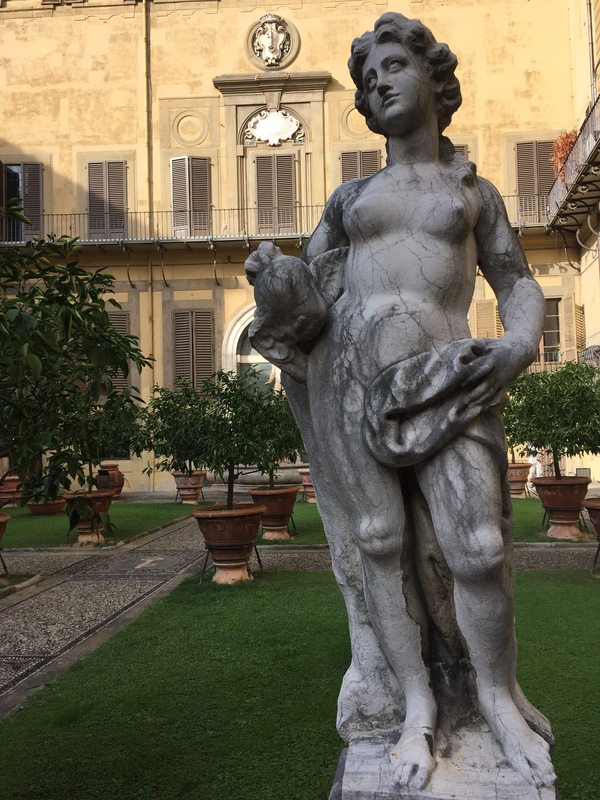 The courtyard also features gorgeous architecture and statuary. 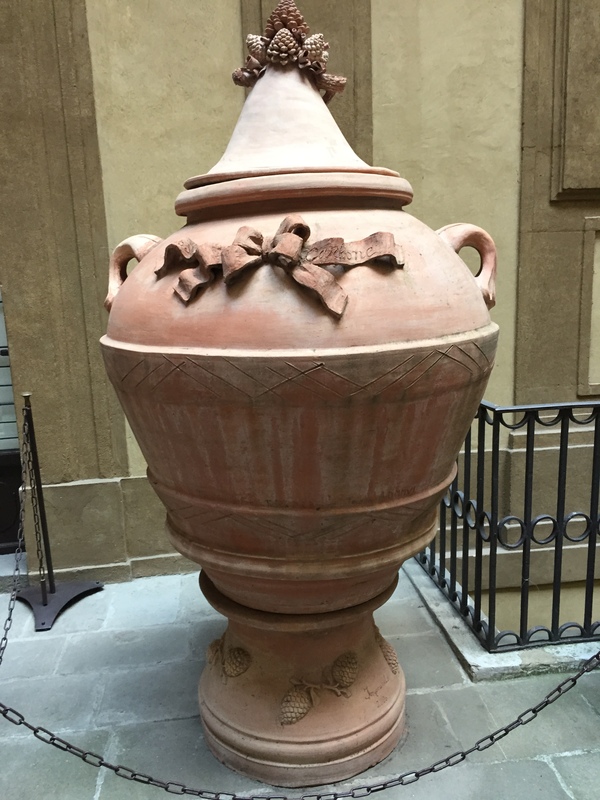 Leaving the palace I was struck by this massive terracotta jar. 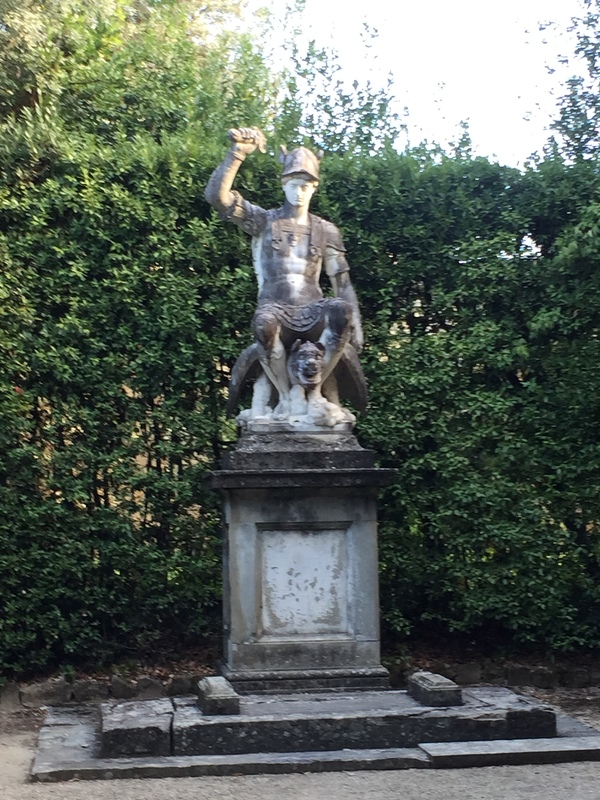 I love to use unique pieces like this as powerful focal points within a particular garden space. Check out the amazingly delicate details of the jar’s lid! Later that same day, I came across this outdoor living space and art installation at a local restaurant. Its sleek, contemporary vibe were quite a striking contrast to the rest of the city. I love these stylish outdoor floor lamps. Weather resistant lamps are a great way to bring indoor sophistication to an outdoor setting. 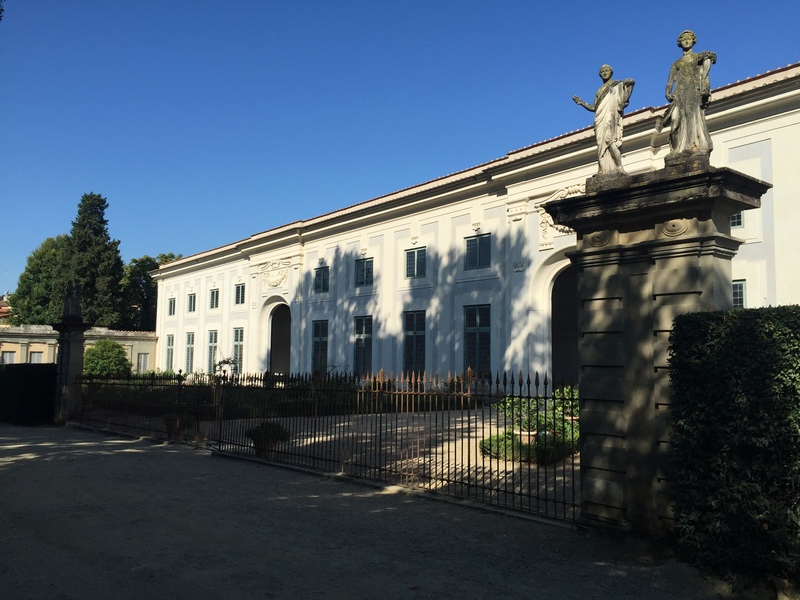 At the end of the day, my friends and I met up at the Hotel Lungarno, a celebrated hotel founded by the Ferragamo family. 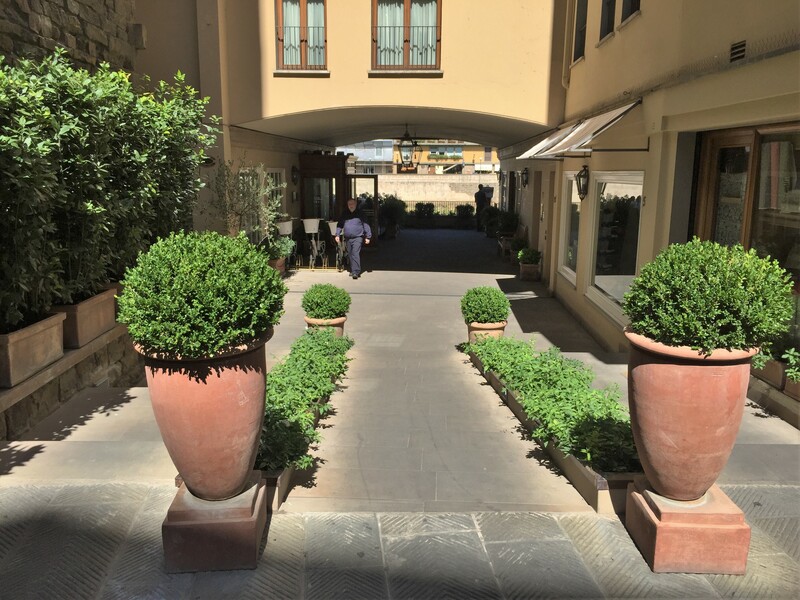 The street-side entrance to the hotel’s breezeway is elegantly framed with potted boxwoods, a simple classic that never goes out of style. 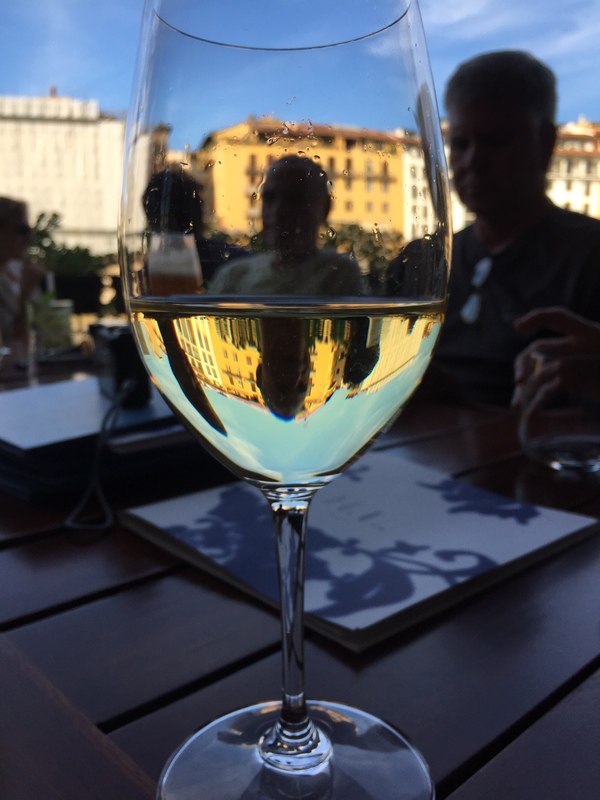 Situated along the River Arno, with stunning views of the Ponte Vecchio, Hotel Lungarno was the perfect place to enjoy a glass of wine after a long day of playing the tourist! 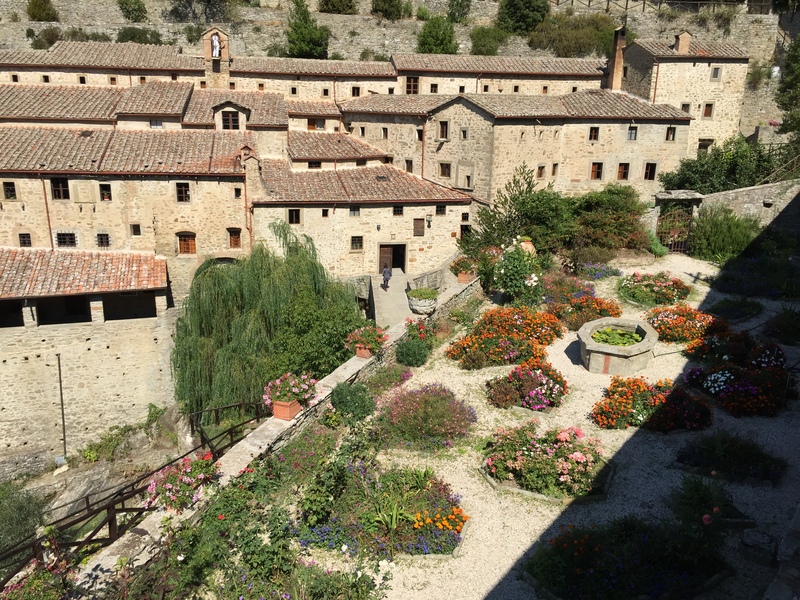 For the next few days, we set out to tour several of the ancient, hillside towns of Tuscany. 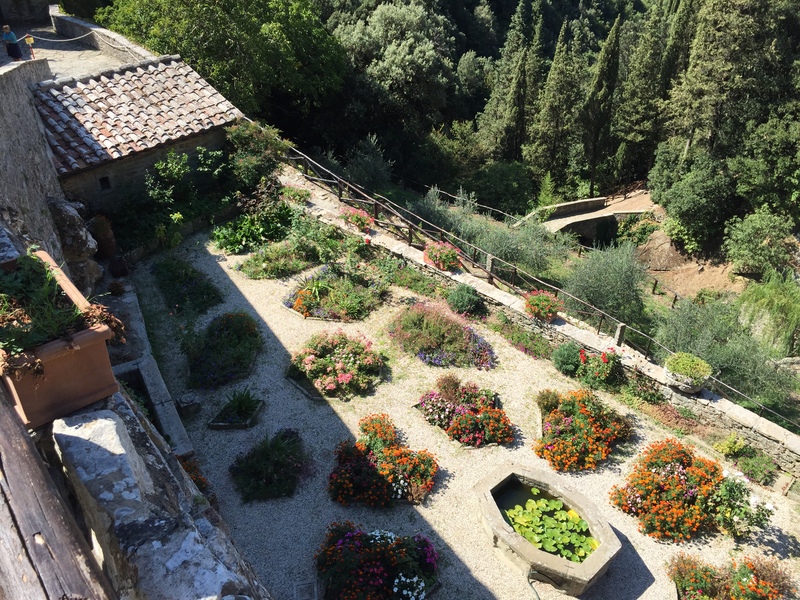 One of the highlights was seeing the town of Cortona and the former house of Frances Mayes, author of Under the Tuscan Sun. 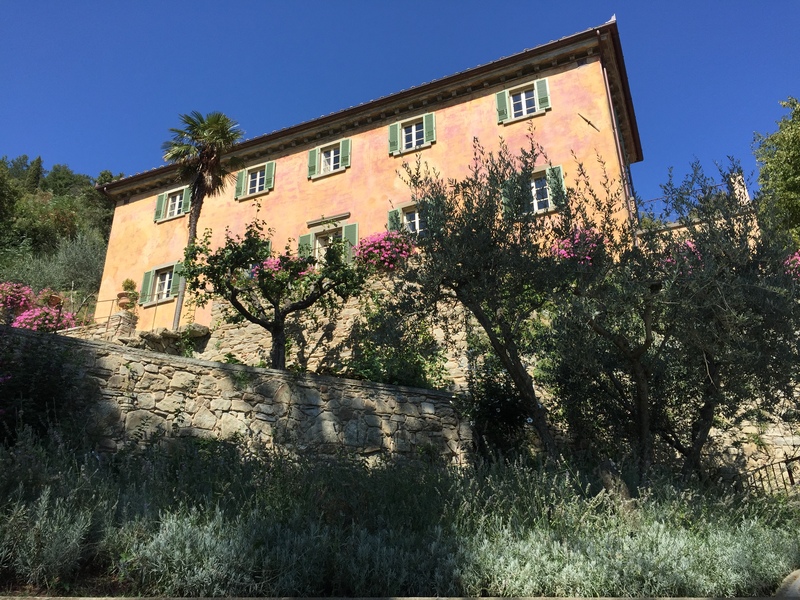 Perched on a steep slope, the property is a beautiful example of how successful and intriguing a terraced garden can be. 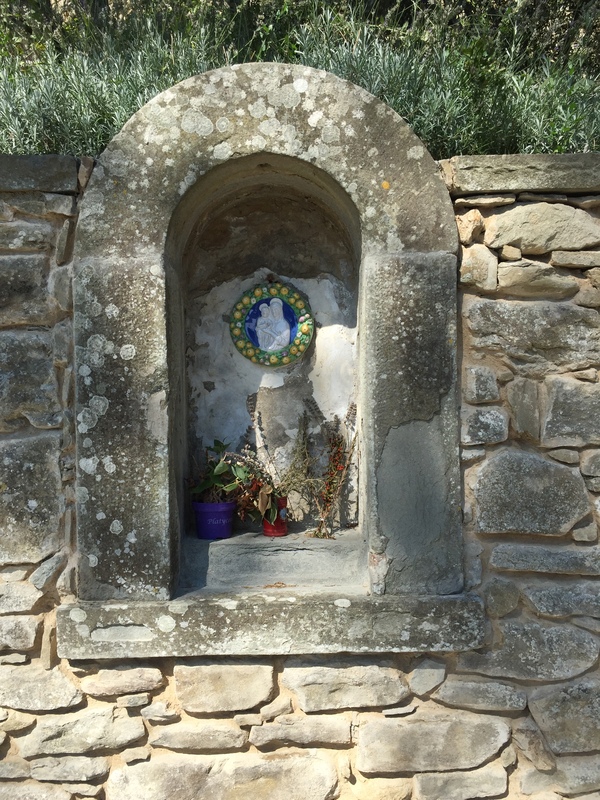 It was also exciting to see this carved stone niche, where, in the movie, an old man from the village devotedly places flowers in remembrance of his lost love. 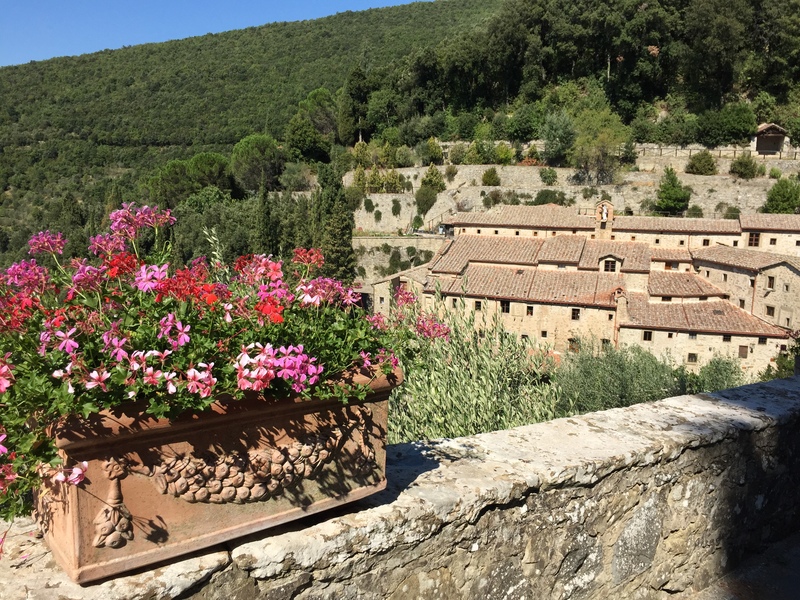 Another special experience was our visit to Le Celle, an hermitage founded in the year 1211 and inhabited by Saint Francis of Assisi. 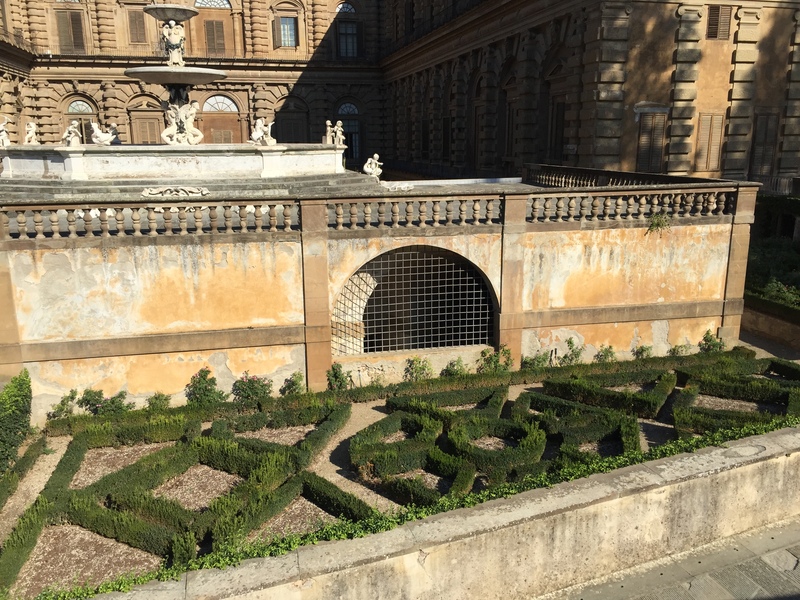 Judging by the look of this flourishing parterre, the 7 or so friars who currently live here are obviously dedicated gardeners! 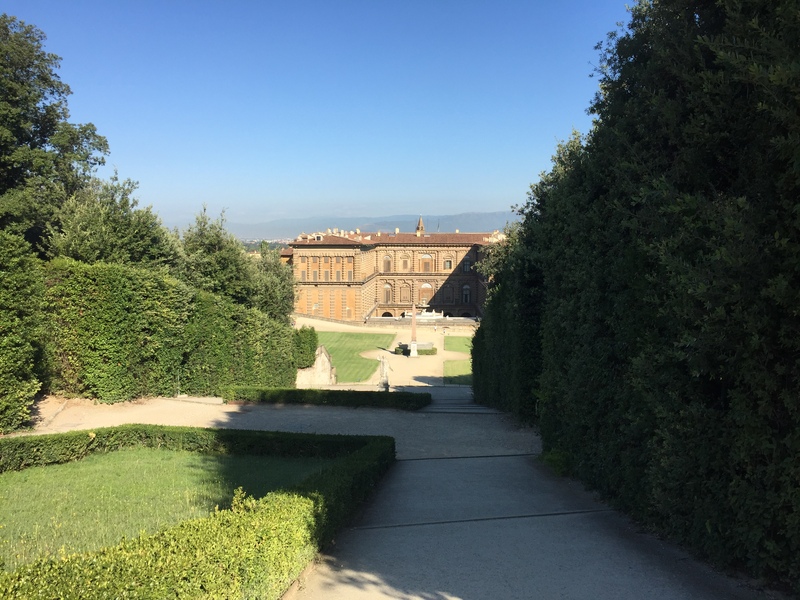 For the last day of our journey, we headed back into Florence and to the Pitti Palace and Boboli Gardens. 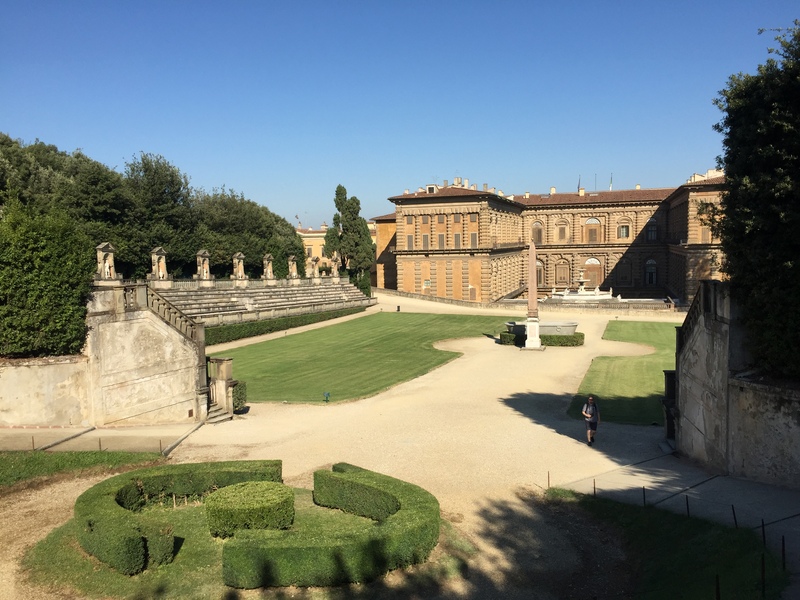 Created by the Medici Family, Boboli Gardens is one of the earliest examples of the Italian Style of gardening, marked by long vistas, an organized layout and ornate ornamentation. 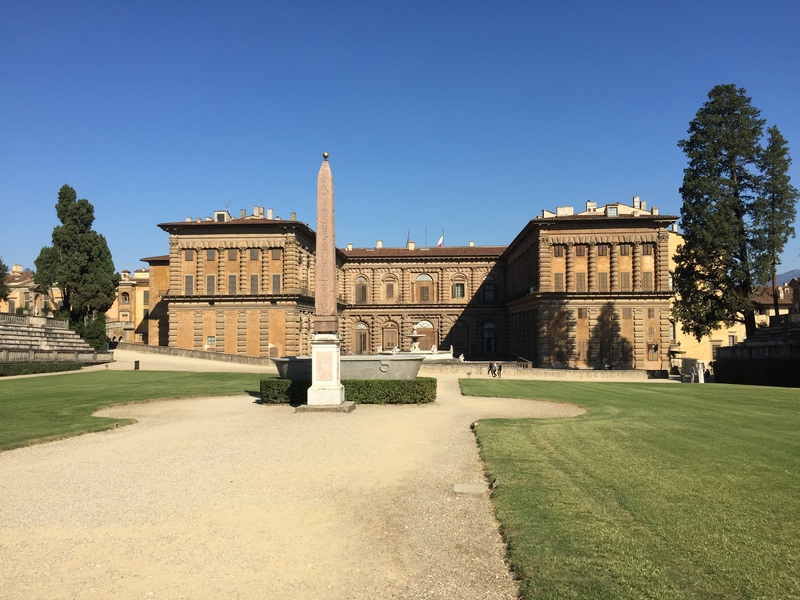 The Egyptian obelisk and Roman basin were moved here from the Medici Villa in Rome. This geometric hedge garden was a previously unseen surprise that revealed itself only as we approached to appreciate the elaborate, rooftop fountain in the background. 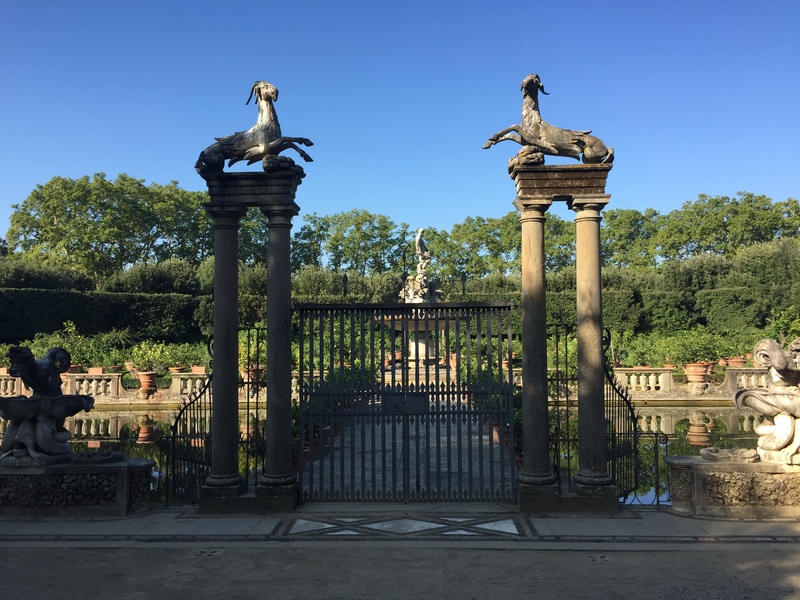 These stunning gates lead to a massive water garden and island, filled with potted plants, carved balustrades and classical statuary. 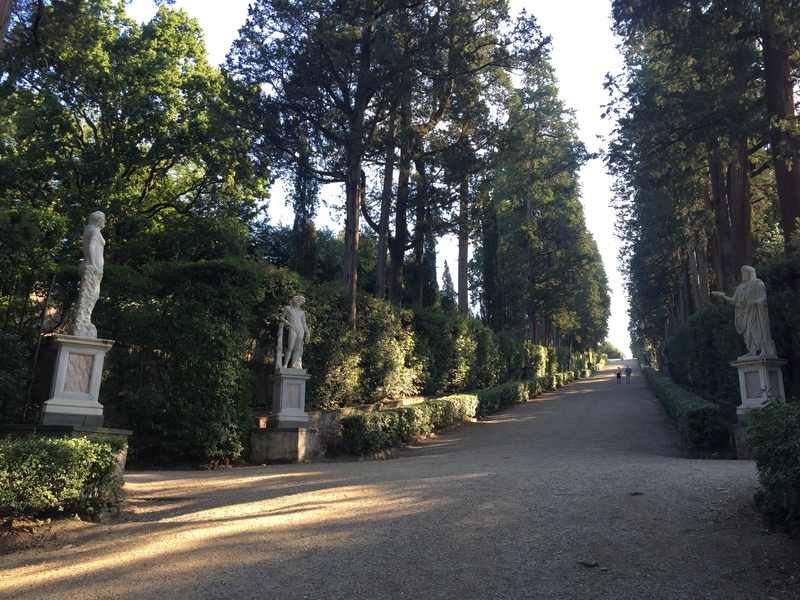 Speaking of statuary, there is no shortage of it in the vast park lands that make up the rest of the gardens! Leaving the gardens, we passed by what I thought was the most beautiful building on the property: The Orangerie. Used for housing cold-sensitive plants during the winter, it is a testament to the value that European Royals placed on gardening during the time this palace was built. 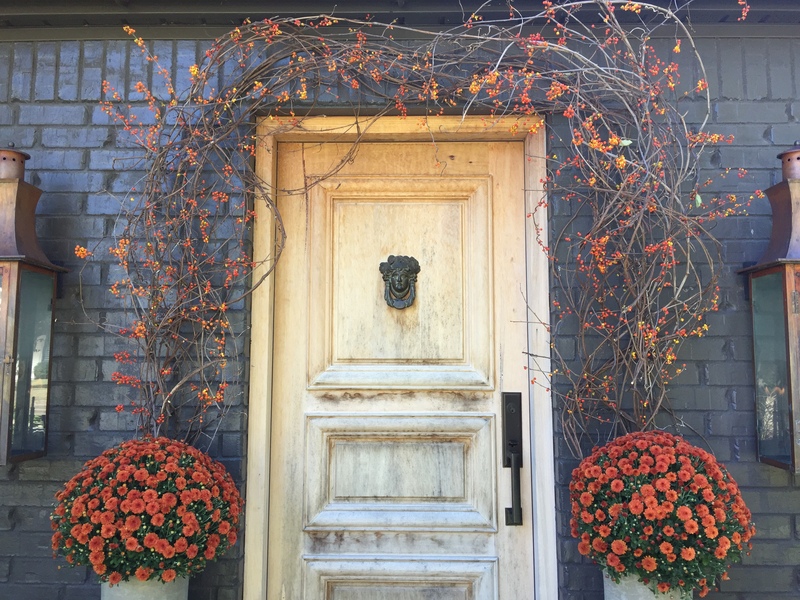 What a gorgeous fall we are having! I can’t believe it is already October, but I am absolutely loving the mild weather and blue skies lately. I hope you are, as well! 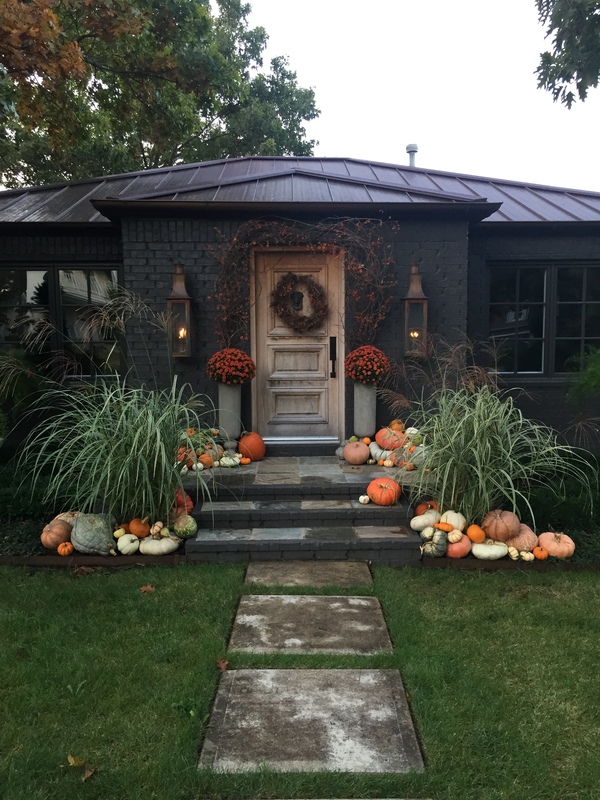 I decided to take advantage of some of that beautiful weather this weekend to get the front porch and entry dressed up for autumn. I didn’t go quite as big as I have the past couple years, but I still wanted a little something to celebrate the season in style. So, I thought I’d share the transformation with you, in case you are in need of any easy ideas for decorating your own outdoor spaces. The entry had gotten a little drab, to be honest. The begonias I planted this spring were fading, and the door mat had certainly seen better days. The variegated maiden grasses at the stairs are in full bloom, however, and made for a good start! 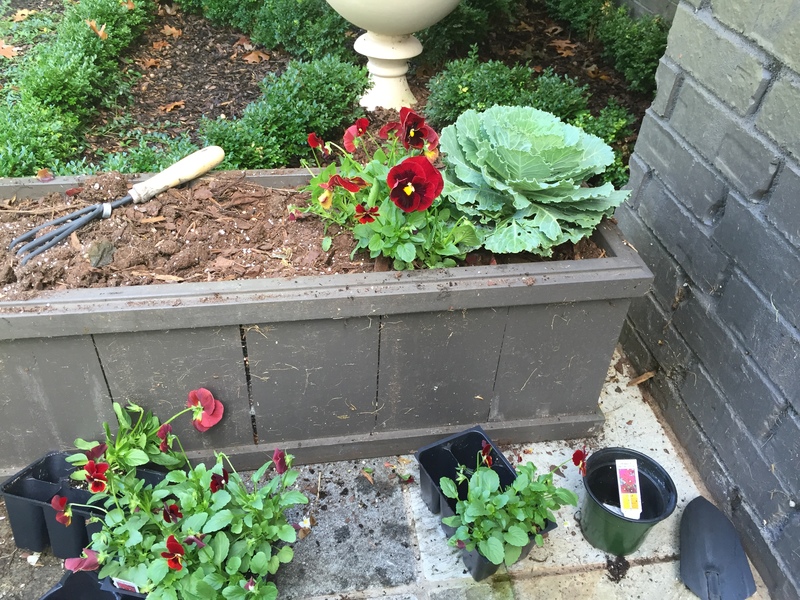 I began my seasonal makeover by tossing the door mat and swapping out the old begonias for new ornamental cabbages, along with pansies and violas in beautiful red-wine tones. Next, I decided to use a pair of urns I found recently to anchor the doorway. I love how tall, narrow and simple they are. 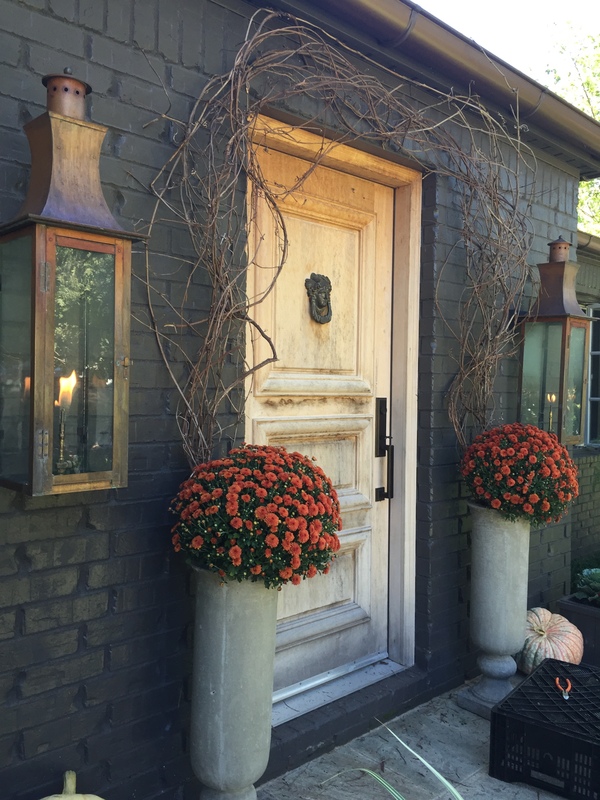 Filled with these vibrantly hued chrysanthemums, they stand out nicely against the dark color of the house. The urns are nice in their own right, but they also serve as the base for an arbor of grapevine and bittersweet. 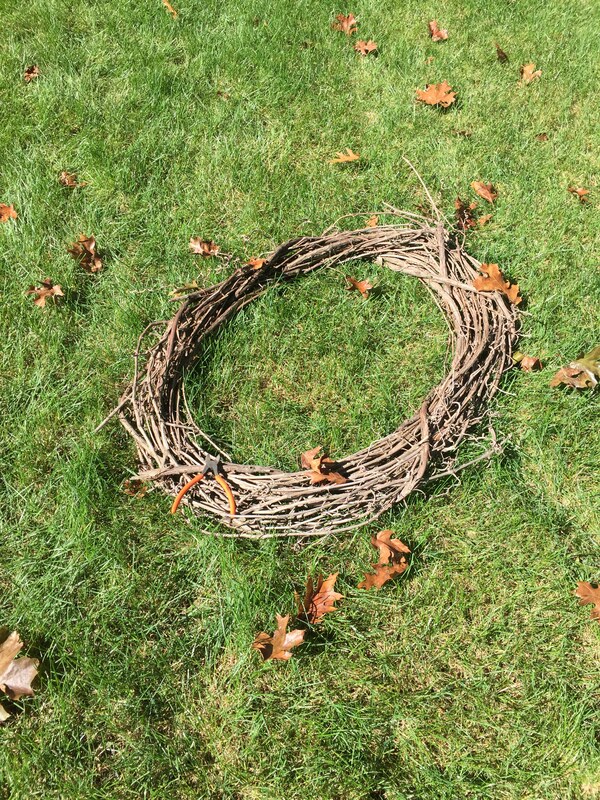 To create the arbor, I simply pulled apart a grapevine wreath from the craft store, stuck the larger ends of the branches into the soil in the urns and trained the vines over the door. A small concrete screw and some wire anchor the very top, so it won’t fall down. 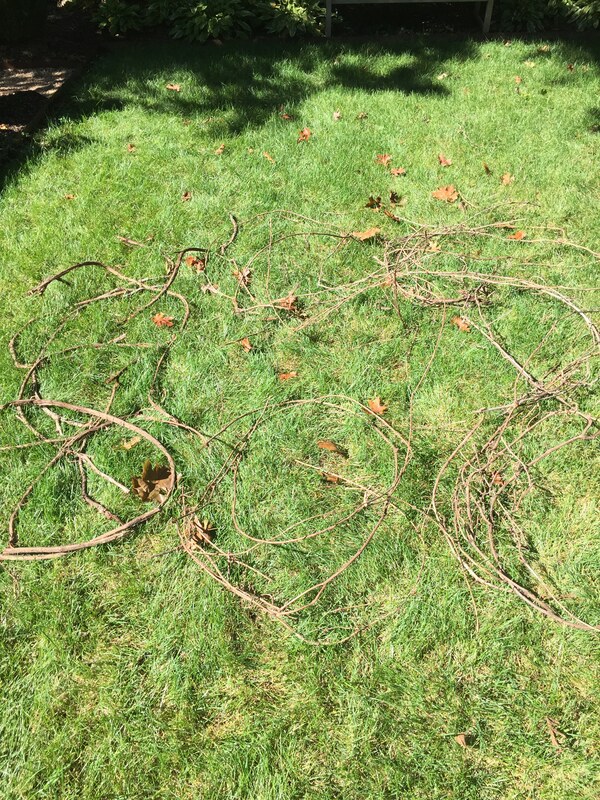 Once the grapevines were in place, I added branches of fresh bittersweet throughout the arbor. The rich colors of the bittersweet echo those in the mums and cause the arbor to “pop” against the dark brick. 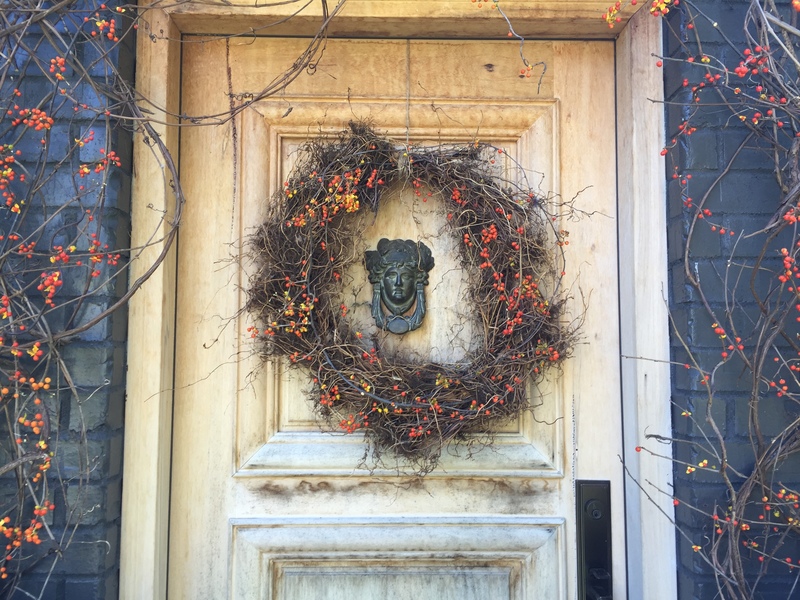 Next, I hung a natural honeysuckle-vine wreath on the front door and embellished it with more bittersweet to match the arbor. All that was needed then, was the final finishing touch (You guessed it! 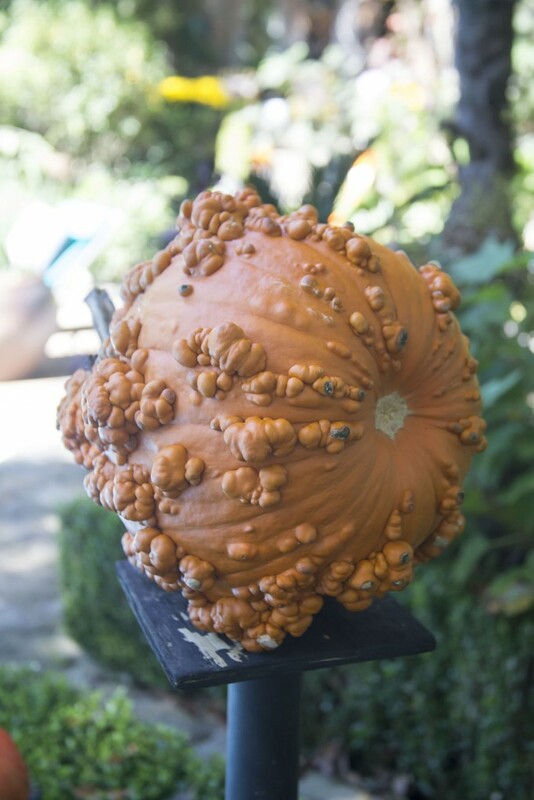 )…pumpkins, pumpkins and more pumpkins! 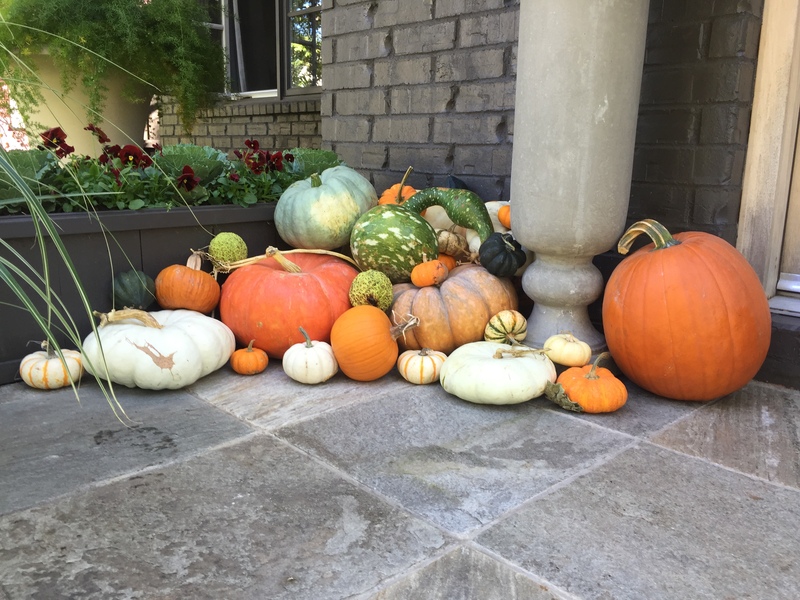 As I said I took it easy this year, compared to past years, but generous piles of fresh squashes, pumpkins and gourds are a must for me and help tie the whole front porch display together! So, one more year’s autumn display is under wraps! 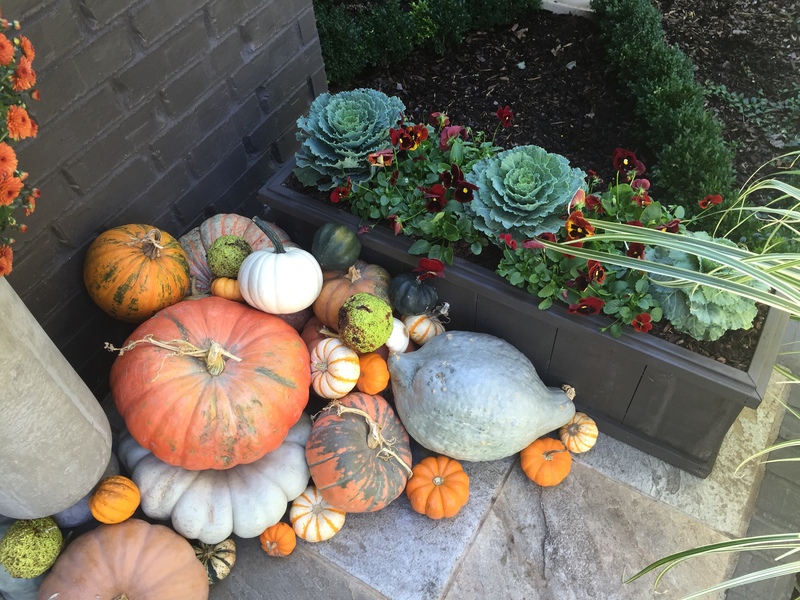 I hope my neighbors like it as much as I do, and I hope it helps inspire some of you to Live Outside the Box by enjoying your outdoor spaces, as well as the bounty of the season! 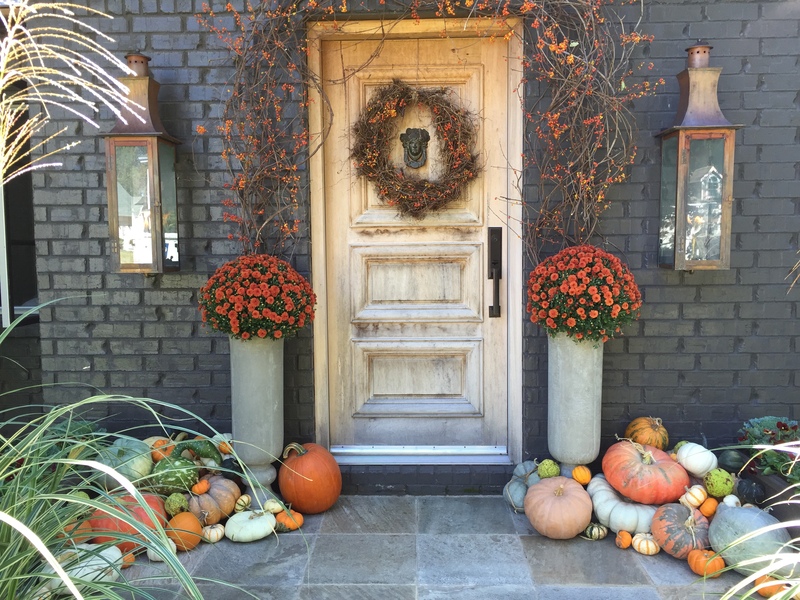 For more fall DIY door and porch decorating ideas follow the blog all this week, beginning with Cara Hazlewood’s post from yesterday, HERE. Anyone who knows me, how I approach my craft, or what excites me knows I love pumpkins. I use them from the time I can first purchase them—sometimes directly from the grower—then deep into winter and beyond. (They can last many months—a fact that wasn’t lost on farmers in the days before refrigeration.) I feel you can’t beat their vibrant colors, wildly varying textures, or happy shapes. 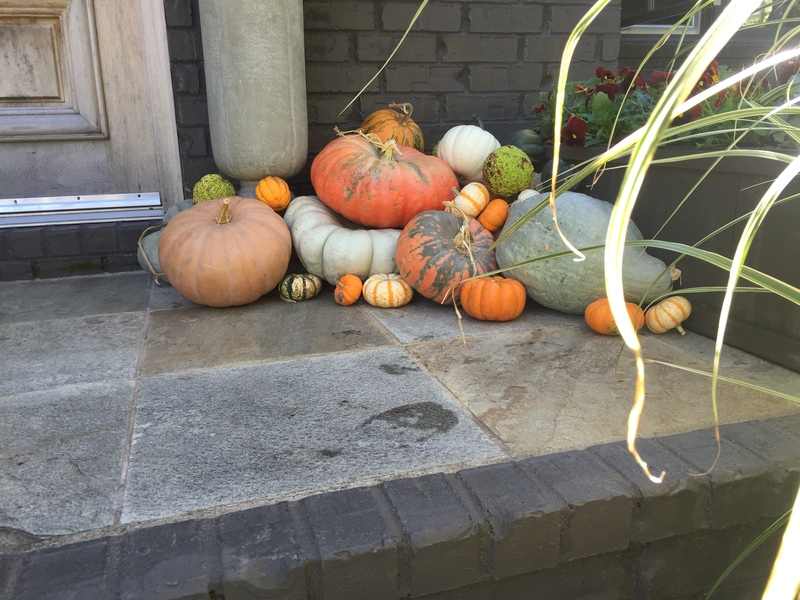 Here’s the thing: they don’t have to be relegated to Halloween displays, carved up into jack-o-lanterns. 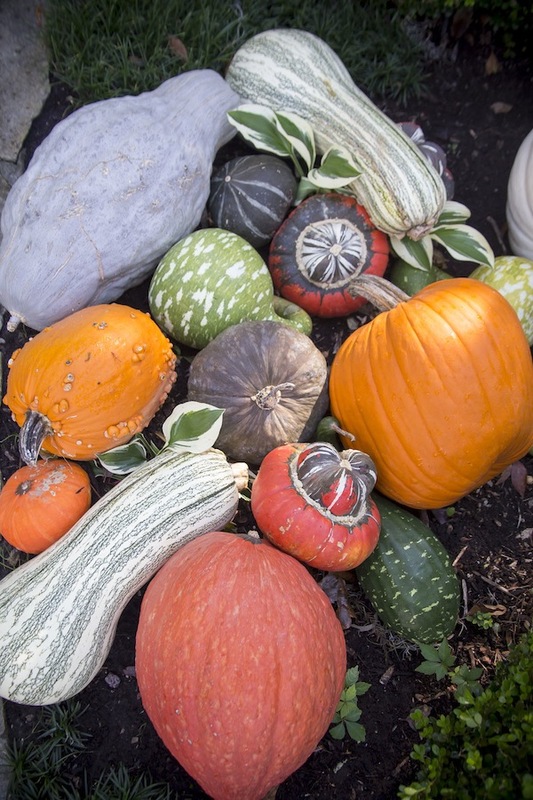 Pumpkins and all their range of colors and textures are wonderful complements to the fall garden. 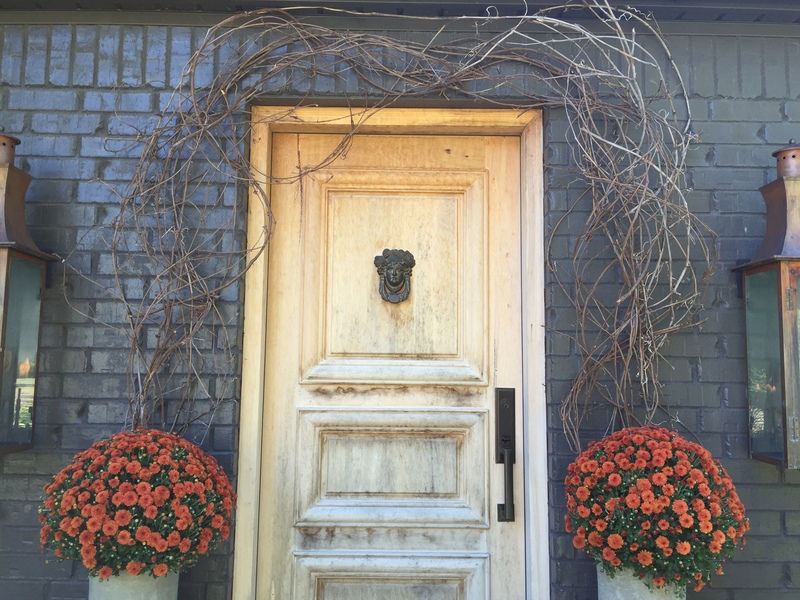 Have you ever noticed how, oftentimes, we love our gardens the most at the end of the season? Everything is at its verdant peak—the colors more saturated, the growth more lush. 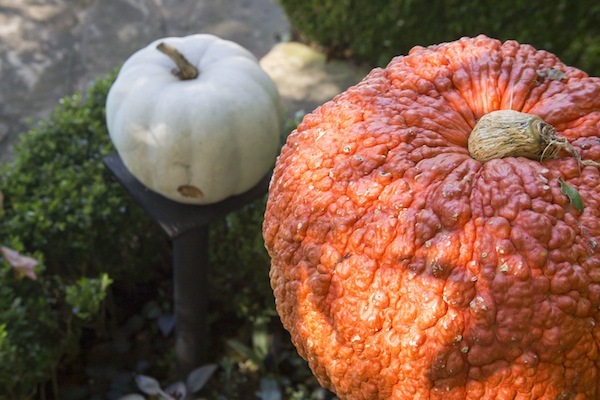 You can add a mix of pumpkins (and ornamental squash) to the plantings you’ve nurtured all summer long. 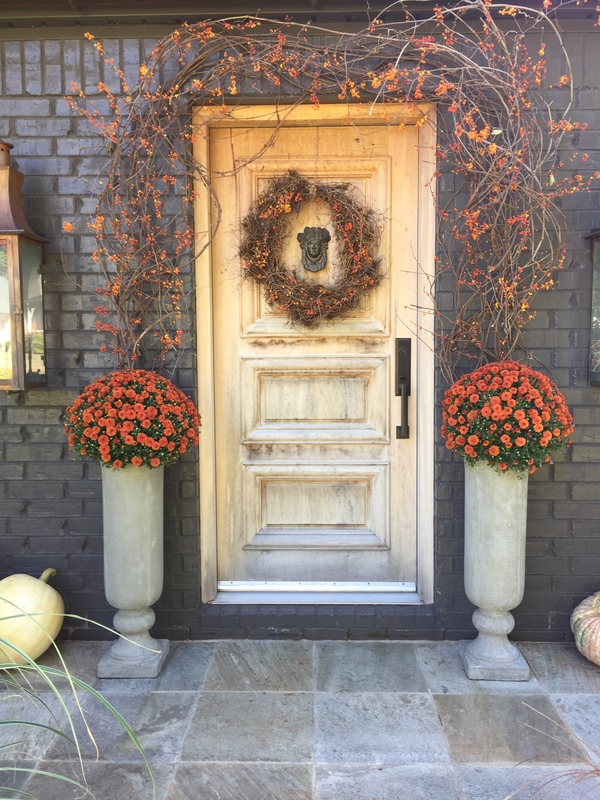 It will add further visual interest and make the approach of fall a little merrier. 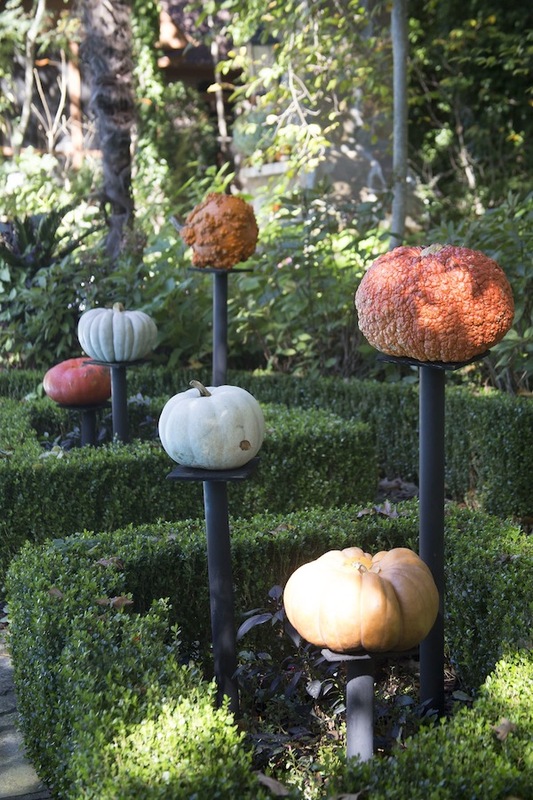 To really get the most out of your pumpkins, why not put them on simple pedestals? You highlight their addition to your garden, add height and interest, and ensure they’ll be noticed. And appreciated. 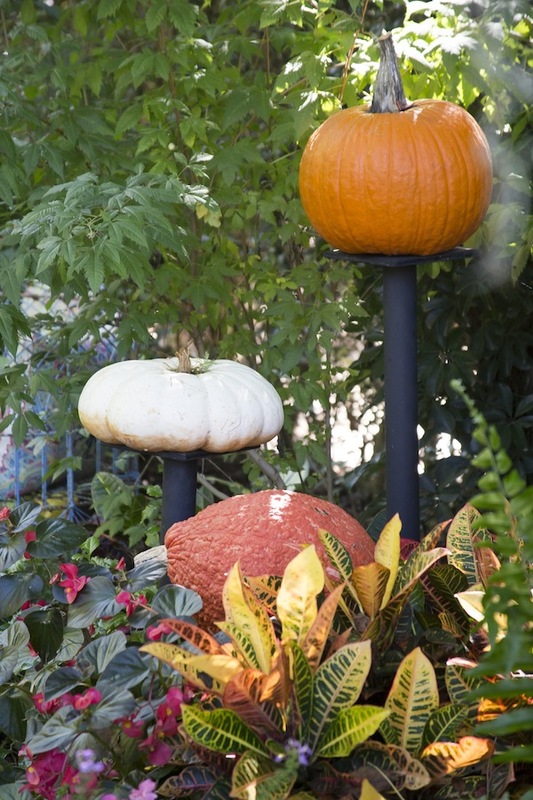 We carry these metal pedestals at Botanica, and you can use them throughout the year. Think about the area you want to use them in. Do you want them to trace the line of your walk? Give height between foundation plantings near a wall? Create visual interest at the end of a path? Provide punctuation to an existing design? Then give them each a small stage, so that they can have their moment in your garden. Notice that I’ve mixed them. 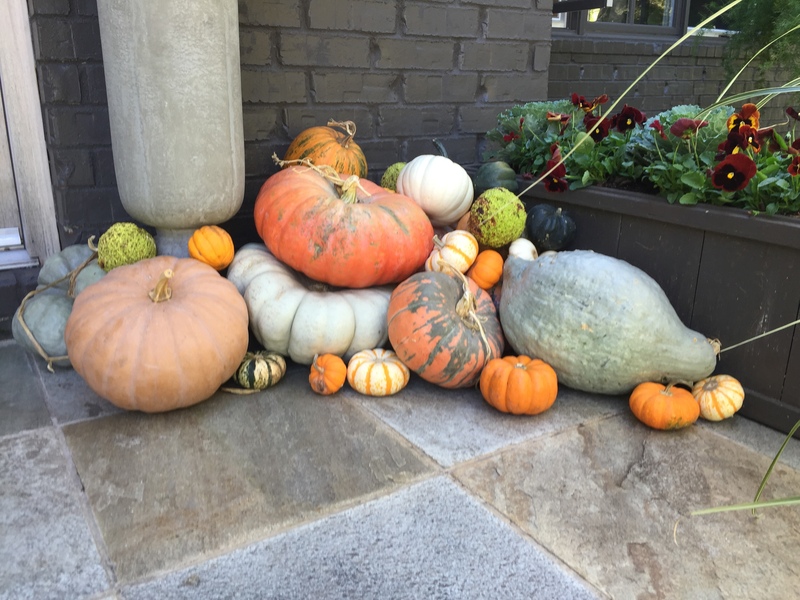 It’s far more interesting to use pumpkins that differ in size, shape, and color than featuring all the same type. The pedestals make the point here that you’ve found really interesting shapes and colors, even warty ones, and you’re now taking them to another level. They become part of your landscape, part of your hearty end-of-season garden when used this way. It’s a really simple idea, but (as is often the case with simple ideas) it’s a good one. 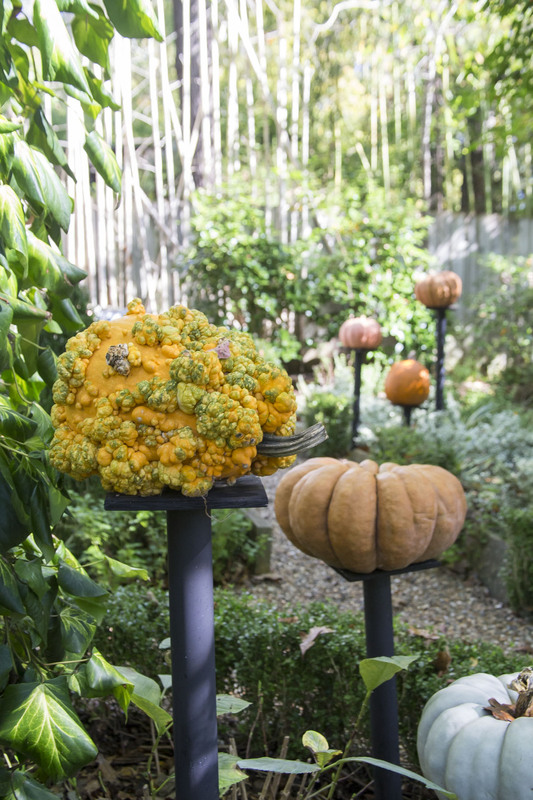 And those little pedestals can be used to display seasonal bits of interest in your garden all year long. 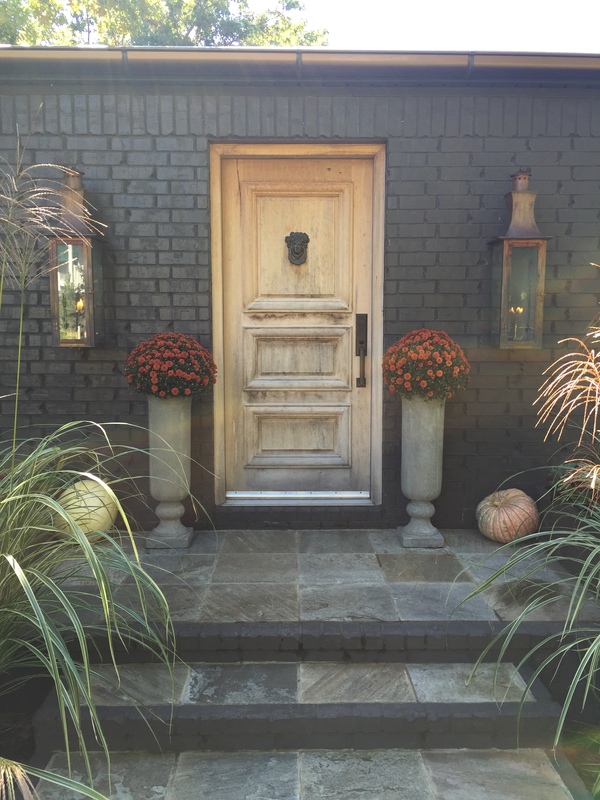 Once you elevate a bit of garden color and texture, you elevate the senses and the design appeal, which is what makes your guests want to come back, season after season. Want to read more from Chris? 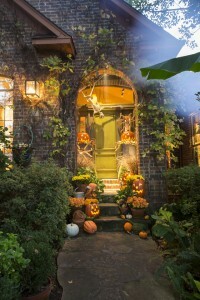 Last month, he told us how to create a spooky outdoor atmosphere this Halloween–check it out. Since the dawn of civilization, humans have created open spaces within their active areas of livelihood, places to gather or linger, areas devoted to expression. 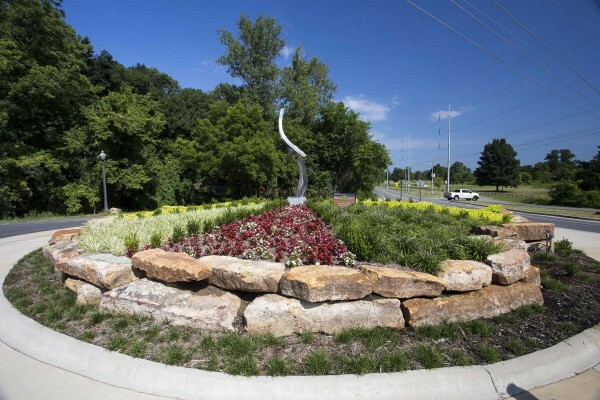 These sometimes-unexpected meetings of hardscape and plantings can also serve as markers of entrance or exit or as punctuation for the grid of streets surrounding them. By creating and opening up such areas, we provide a certain respite from urban chaos and make an area, although carefully planned and executed, that is serene and almost pastoral. 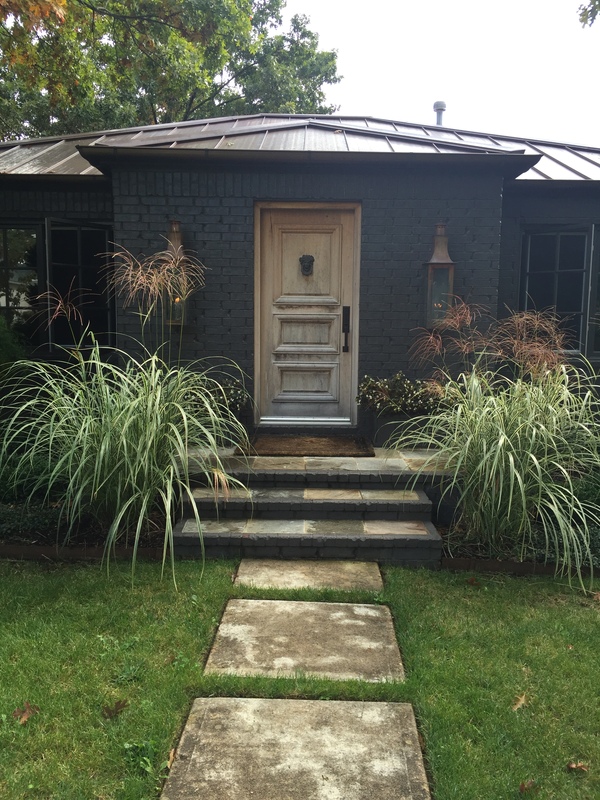 The design elements for these plantings are really quite simple, and you can follow them to either establish a design for your neighborhood or create such a space for yourself. What you need is an area that is somewhat level and always accessible. If you’re designing something for your neighborhood, think about the entrance or even an available empty lot. (Yes, seek permission first.) You want a place that can be seen. Craft your bed for planting, remembering one fact: Nothing square is found in nature. Use a pattern that is circular, somewhat so, or even will have a bit of a curve to it. Always raise your bed. It will make your planting more important. Now play up texture, by using something like the stones used here. 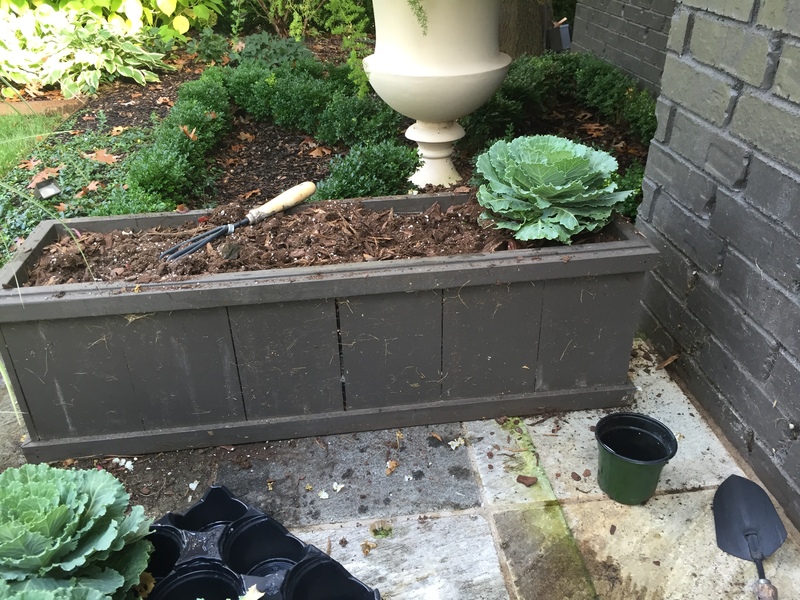 Since raised beds mean your plants will be closer to eye level, be mindful of heartiness and color. Work your way into your space, by first using lower plants. Then, add a secondary element. This can be taller plantings, bloomers, or greenery. You want a bit of contrast. And you’ll also want to find plants that are easy to maintain and hardy in most weather. 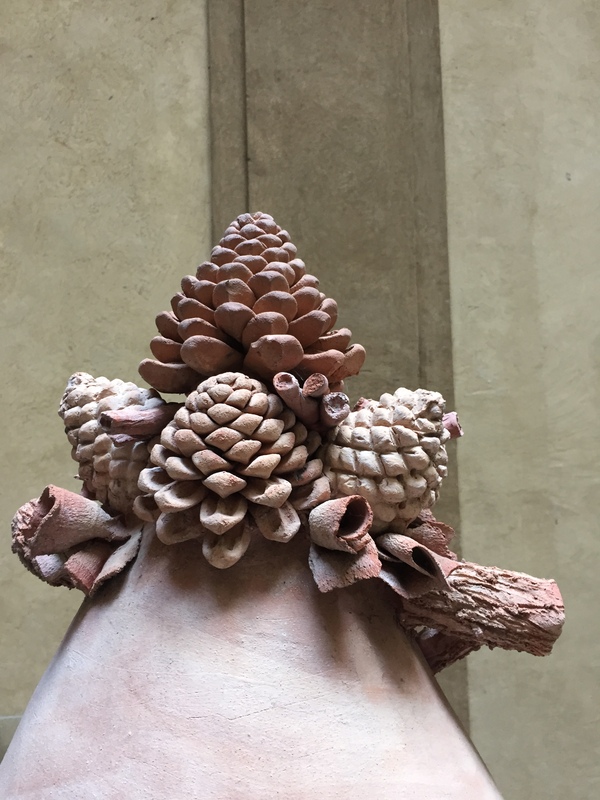 Then add the focal point, like a bit of sculpture shown here—although your piece of interest doesn’t have to be metal; you could just as easily select an urn placed on a pedestal, or even a tall plant or tree, blooming or not. 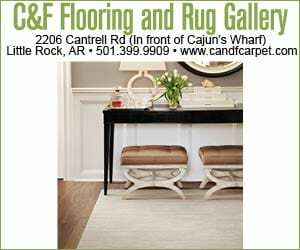 The idea is for you to select whatever pleases you and will provide year-round interest, for the focus of your design. 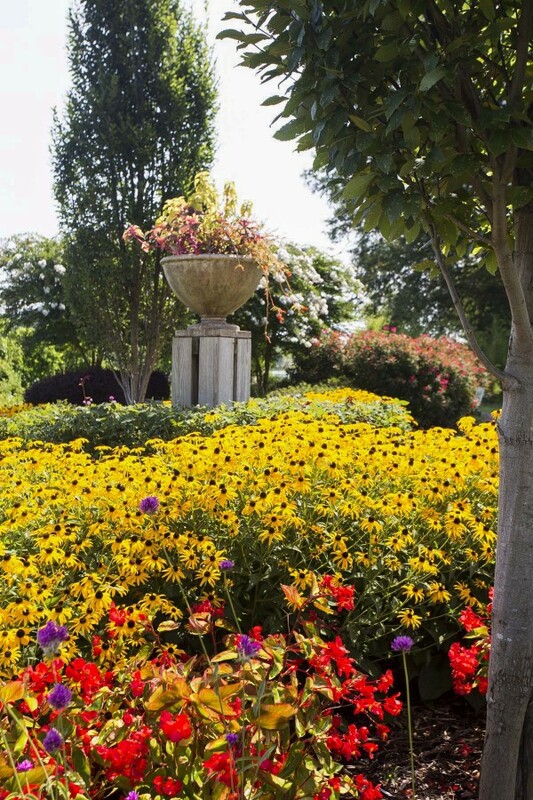 Your design for a public place can also be full of rangy color, like this bed full of rudbeckia, begonia and gomphrena. If you want something that is seasonally vibrant, here’s the one for you. Emphasis is placed not on art, but on color. Good design needn’t be complicated or require lots of sourcing of materials. 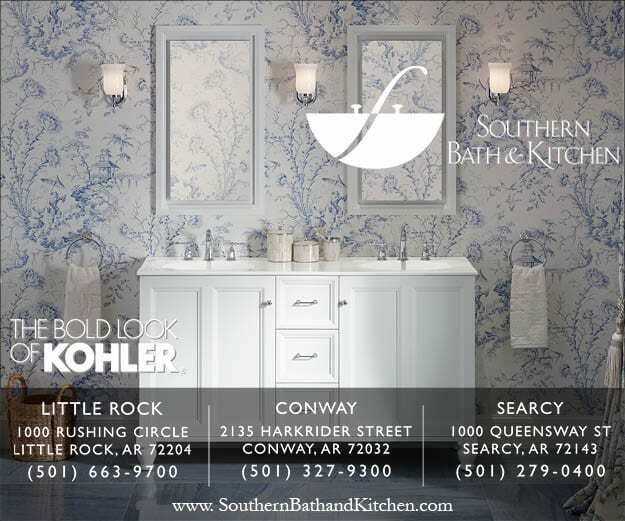 Find an area for your design, then fill it with what you love, what speaks to you. You can take the principle of ‘public place’ and make it your own ‘private space.’ Just remember scale and good siting for your design. Assemble and sit back and admire. Or forget it until the next time you walk out your door or round the corner. It really is that easy. Hello again. I hope you had a wonderful Independence Day weekend! I love the 4th of July, and my birthday just happens to come the day before, so I always have a lot to celebrate in July. This year I spent the weekend at the lake, soaking up the sun and eating all my favorite foods, generously prepared by my friends. It was a lovely time, and I couldn’t resist sharing this sunset photo from my birthday night. Glorious! 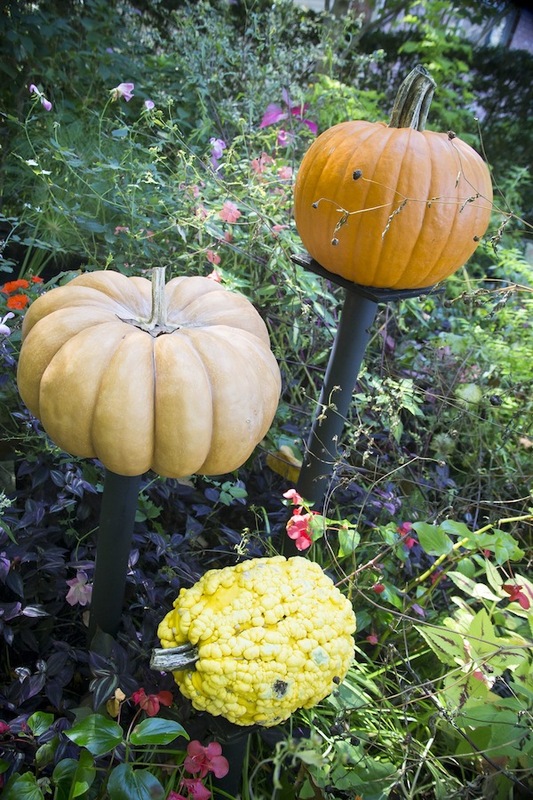 Gardeners tend to embrace seasonal change—love it. even. 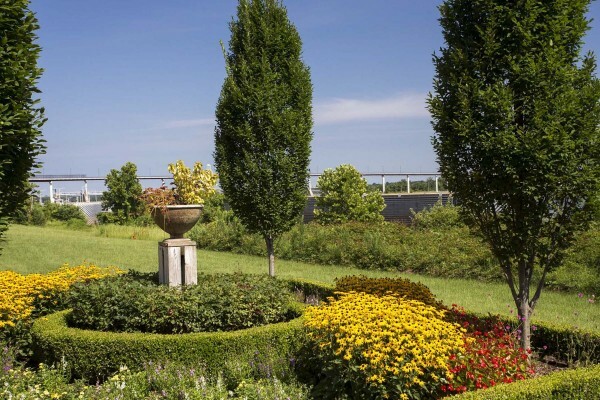 With each transition comes the opportunity to change out plantings, play up design ideas, or implement new color combinations. And it’s all about renewal, which resonates with all humans. But sometimes, don’t you wish you had something to use that is a bit more long lasting? Impervious to the seasons? Here’s an idea you can incorporate into your planting scheme, and it doesn’t entail construction or site plans. 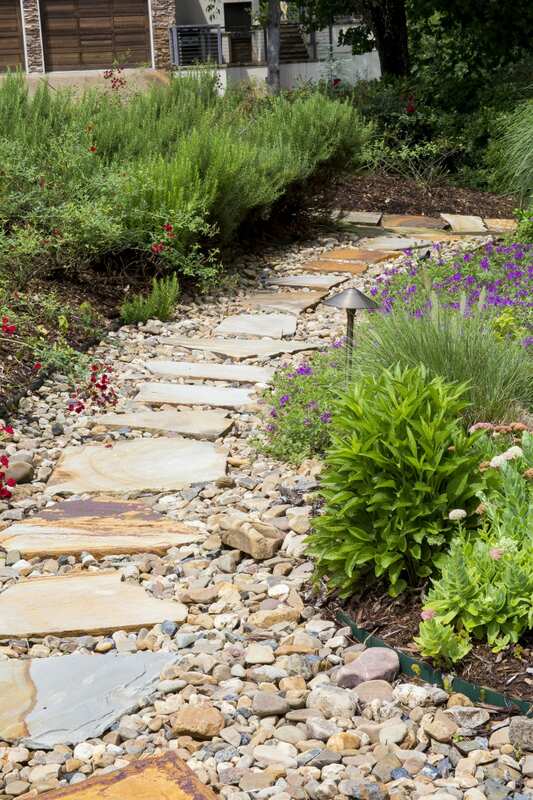 Use cut flagstones to create petals in the outline of a daisy, a nice sort of punctuation to a bed, or bend in the garden path. 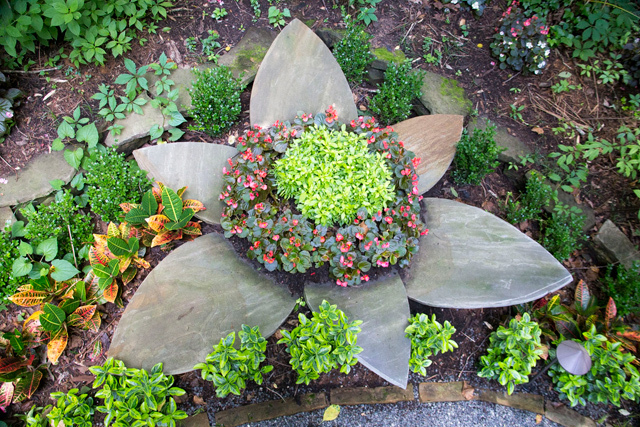 Decide how large you want your stone daisy, and create a template to follow to cut out the shape of petals. You’ll want to think about circumference, so petal size and count is important. I had the room, so I created a flower with six good-sized petals. 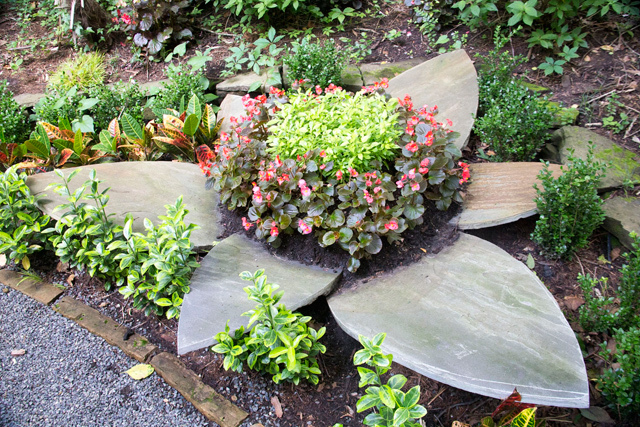 You won’t have to cut out a stone for the flower center because you’ll use that area for seasonal plants. Flagstones must be cut with a diamond blade, which you can rent, or ask the rock yard to use on flags you purchase. (Most yards or quarries will have one to cut stone.) Here is where having a template to follow for the petals will come in handy. Because your daisy will be home to concentrated and highlighted plantings, prepare and amend the soil well. Dig deep enough to place two or three concrete blocks just beneath the surface where the petals will rest. The blocks—a crucial addition–will support your petals and keep them from sinking into the cultivated soil. Arrange the petals with care, working to create a nice round circle that will be planted as the daisy center. Notice I overlapped the petals a bit to create depth. You’ll need to step back from time to time to check the shape of your design, and maintain that round shape for the important flower center. Once the daisy is assembled, now comes the fun part. Plant the flower center so that it’s almost bursting, with plants selected for tight shape and good color. A mix of foliage plants and bloomers is best. 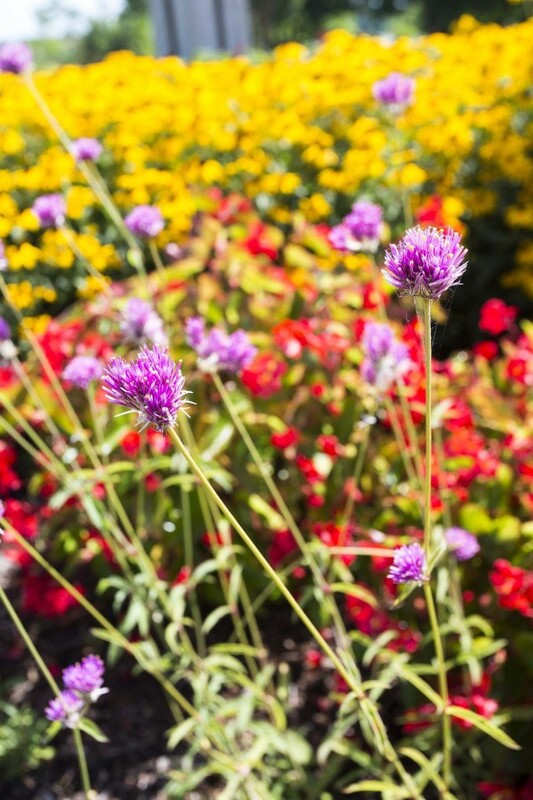 Be sure to finish planting with time-release fertilizer, so you’ll have optimum color throughout the season. Plant around the edges of the daisy ‘petals,’ but not too closely. You want to be able to discern the shape of your daisy and its petals. The year progresses, and the colors and plants and growth habits change, but you’ll have a garden resident that will outlast them all. And it’s nice to occasionally have something that will make you smile in the garden, like your stone daisy. Hello again; I hope you are having a fantastic February! 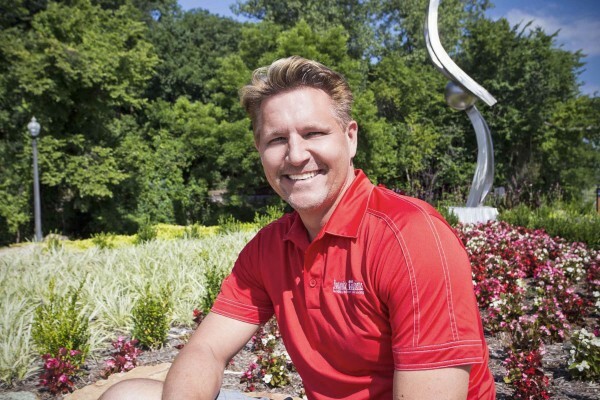 Although February can be a pretty slow month when it comes to your garden and outdoor living spaces, it is a great time to organize your thoughts, make plans and get inspired for the upcoming spring. To that end, I thought I would share some more photographs from my visit this past summer to Charleston, South Carolina. While there, I took a day trip out to Middleton Place, one of the many historic properties in the area. Middleton place was first settled in the late 17th century and encompasses our nation’s oldest landscaped gardens. The estate has remained under the control of the same family for some 320 years and is well worth a visit! The formerly grand main house was burned during the Civil War. This is the principle structure still standing today…one of two accessory dwellings that flanked the main residence. 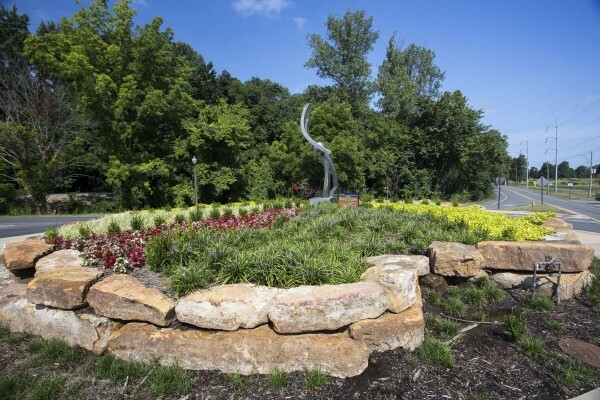 It is filled with historic artifacts and antiques, and as you can see, is surrounded by wonderful, old trees and plantings. This pile of rubble is all that remains of the old main house. A reminder of a dark chapter in America’s history, it is a bit eerie, but also a moving link to our historical past. Another link to the past is this massive tree base. As someone who loves driftwood and the like, I was captivated by its sculptural qualities, and it is fun to imagine it in its former glory, shading the house with its massive branches. As you approach the house, you pass through this charming garden gate. I love gates and try to incorporate them into designs as much as possible. 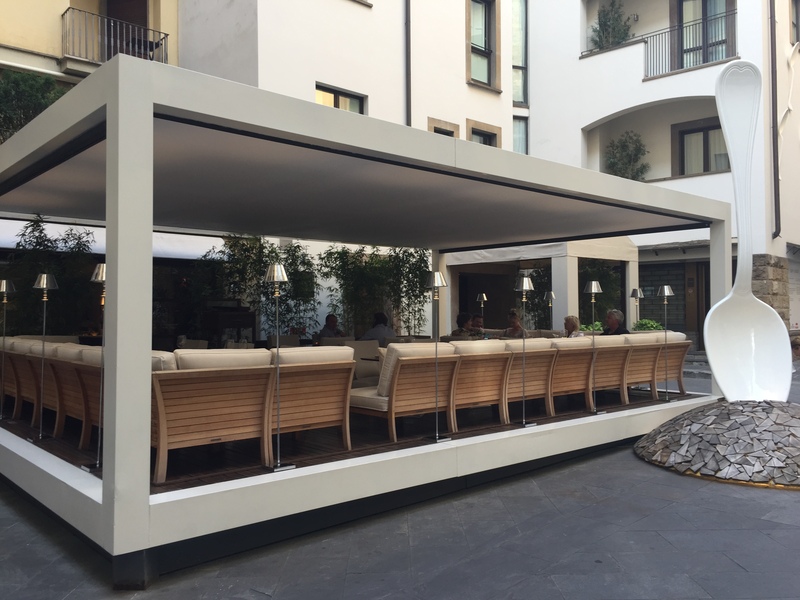 They are an easy and attractive way to create a sense of arrival and coziness in a garden space. This gate, painted in traditional Charleston green, is visually light and airy and gives the path beyond an intriguing, mysterious appeal. Nearby, this bench is nestled against a centuries-old brick wall. Garden benches are another of my favorite design elements, as they can transform just about any spot into a relaxing destination. The low wall is also a noteworthy design tool. Here, it divides a large lawn from a shady pleasure path, giving both areas a sense of definition and purpose. I just love garden ornaments, so I couldn’t resist the remains of this old urn. 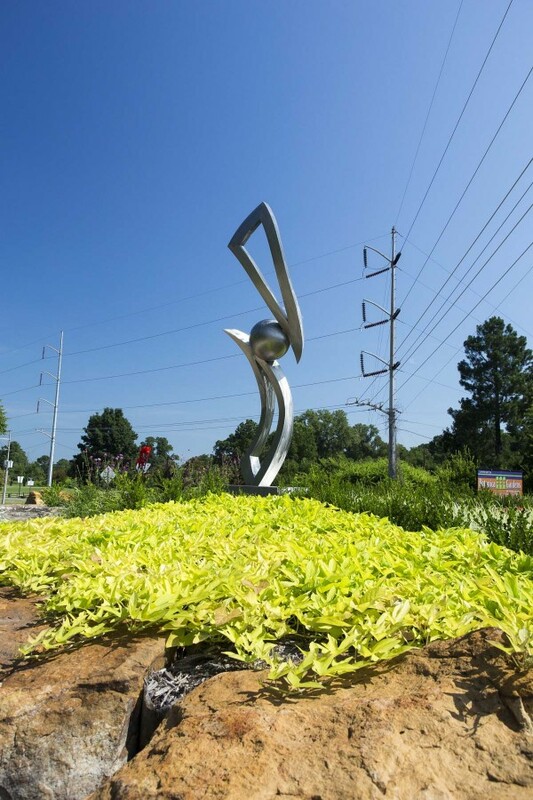 It presides over the grand lawn that sweeps past twin lakes, known as the Butterfly Lakes because their design was modeled after the wings of a butterfly. 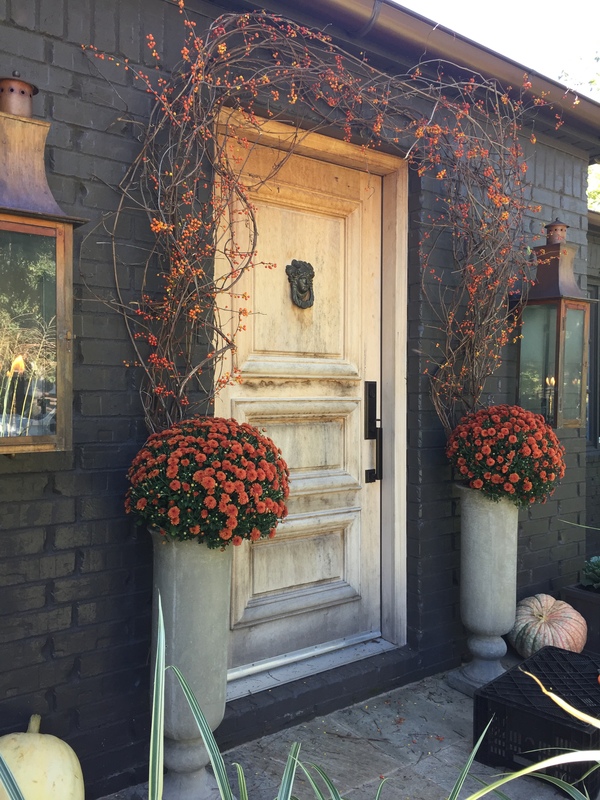 Ornaments, such as urns, sculpture and statuary, offer appealing contrast value to natural plantings and are essential additions to any garden or outdoor space. The Butterfly Lakes also frame a stunning view of the Ashley River, which actually served as the primary mode of transportation to Middleton Place back in the day. So, what you see here was basically the outdoor reception hall! Not bad, huh? The precise alignment of this vista with the bend in the river was a deliberate design decision and exemplifies the expert skill and care that was employed in laying out the property. Having a well-designed plan always pays off! Another garden ornament, this sundial joins a glorious Live Oak in stealing the show in one of the formal garden rooms featuring geometrically arranged paths and clipped boxwood hedging. While you may not be able to recreate the shelter of this unbelievable oak tree, this is also another good example of how a simple garden bench can turn a forgotten corner into a place to stop and smell the roses. The lawn in this garden room may be a little worse for the wear, but the combination of a strong, deliberate design, structured evergreen plantings and central ornamentation makes for a great example of what I call a winter-worthy garden. A well-designed garden should be appealing throughout all four seasons, and winter is the perfect time for assessing the worthiness of a particular space. Even covered in snow, the value of the pathways, hedging and birdbath in this garden could still be appreciated. This is a view across the Rice Mill Pond with the mill, itself, in the distance. The pond is and was a source of irrigation for the gardens of Middleton Place and is a beautiful setting for a garden stroll. A pump house near the Rice Mill Pond is nestled among towering oaks dripping in mood-setting Spanish moss. 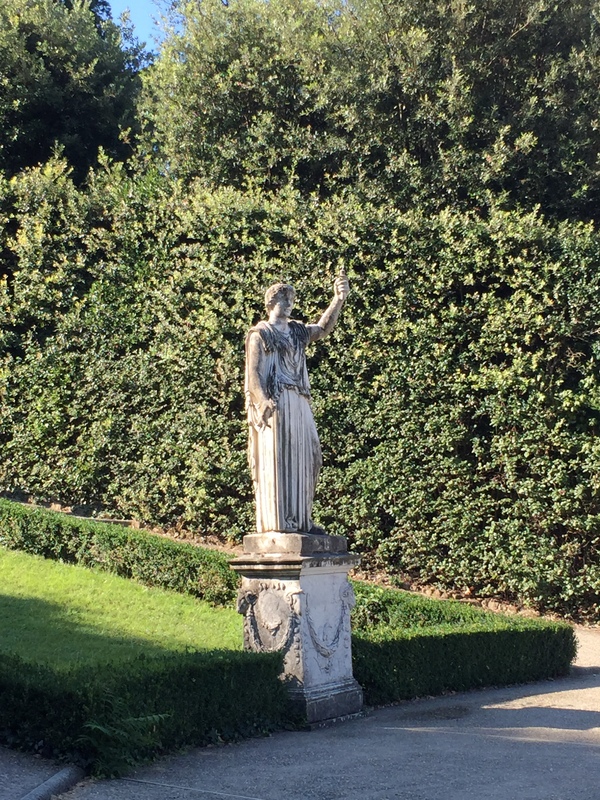 This marble statue serves as a focal point at the termination of this garden path. Framed by hedges, it is another good example of the value of properly placed garden ornaments. Well there you have it…my version of a garden tour at Middleton Place. I strongly encourage you to experience the real deal, if you are able. Or, at least check out their website to learn more about this enchanting piece of southern history and to garner more inspiration for your own springtime gardening projects!